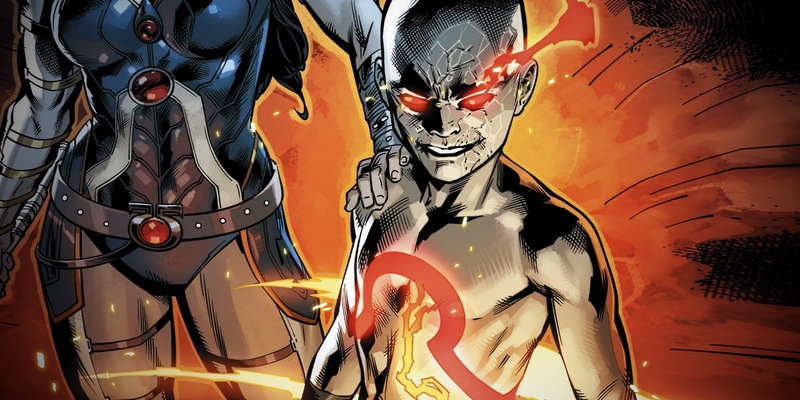 The legendary Darkseid has returned to full power in DC's Rebirth, and killed a Greek God in the process. There's a good chance that casual DC fans won't even have noticed Darkseid's absence, since his presence in DC's universe is and has been a constant. But when he was killed shortly before the DC Rebirth relaunch, he wound up contained in the body of a newborn baby. He still had his daughter Grail to look after him, and before long, that meant consuming gods to restore Darkseid's powers. The Fourth World of Apokolips and New Genesis may be teeming with New Gods for Darkseid to kill and absorb, but with he and Grail marooned on Earth, they were forced to deal with what they had on hand. Mainly, the demigod children of Zeus scattered across the planet living for centuries, if not millennia. But in Wonder Woman #37, Darkseid reveals the true aim of his plan. Children of Zeus are good at getting the Old God's attention, but to restore a being like Darkseid to his full power... Zeus has to be killed. By the time Darkseid and Grail pop onto Wonder Woman's radar (herself a daughter of Zeus) they have managed to turn Wonder Woman's twin brother Jason against her. Outnumbered and ambushed, Darkseid begins to drain Wonder Woman's own divine essence... until Zeus steps in to look after his daughter, Diana. And from the first punches thrown, it seems Darkseid could only stand his ground at full power - not as the reduced, teenage version of himself he's trapped as. Unfortunately for fans of a father/daughter team-up between Wonder Woman and Zeus, even this is part of Darkseid's plan. Wonder Woman was merely the bait to draw out his true target. And Zeus, sadly, never had a chance. As Zeus falls, Darkseid rises: restored, and back to his full size and maturity (a task only achievable with the entire essence of the King od the Gods himself). Om the micro scale, it helps establish and reinforce a scale of godly power in DC's comic universe. However, Darkseid reveals - as he tears the last bits of life from Zeus - that he tricked him, and exploited Zeus's righteous fury and fatherly willpower to slowly siphon off his powers. So even if fans might assume that an Old God of Earth is more powerful than a New God like Darkseid, his cunning more than makes up for the difference. That equation might give and edge to both Wonder Woman and Jason, both demigods of Zeus, if they should challenge Darkseid in combat. And seeing her father's body turn to dust before her eyes, Diana is ready to face Darkseid in solo combat. Until the Justice League shows up to 'help,' costing her any chance at vengeance in the process (or so Diana believes, in her anger and grief). Maybe some day the two will clash, but for now, the winner is anyone's guess. The only thing we know for sure is that Darkseid is back, and almost certainly looking to claim Apokolips once again. While back on Earth, the ancient King of the Gods has died. Rest in peace, DC's Zeus. Wonder Woman #37 is available now.